Class is in session and all the youngins out there shaking a tail feather and playing dress up are about to be schooled by the ageless, timeless, and always present, Mr. Lee Fields. “Special Night” is the latest offering from a man whose career has spanned 50 years and as Oliver Wang of NPR once said, “In a curious case of musical evolution, the older Fields becomes, the closer he gets to perfecting the sound of soul that he grew up with as a young man.” “Special Night” is no exception. An epic 6 minute jam split into parts one and two on the 7″, “Special Night” is a story of love and loneliness told from the perspective of a man with extreme life experience and deep wisdom. 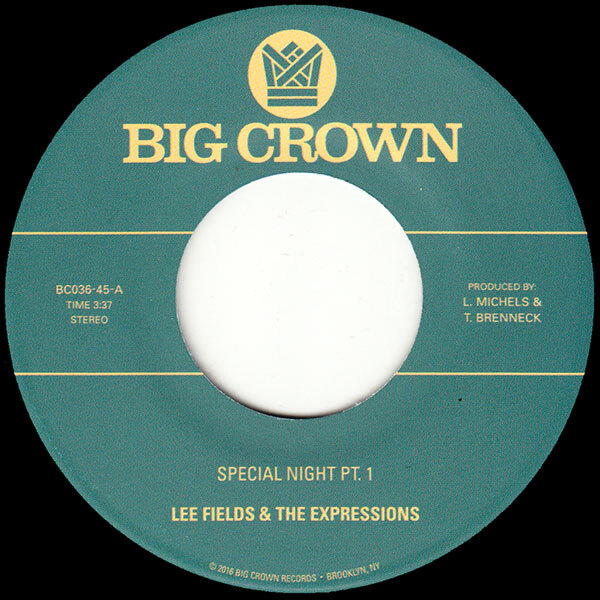 The tune is the perfect storm of production duties handled by Leon Michels and Thomas Brenneck alongside the inimitable musicianship of The Expressions, and recorded at the legendary Diamond Mine, “Special Night” is in the humble opinion of the Big Crown team, one of the greatest pieces of soul music Lee has put to record thus far.